I'm not aware of another company making this pattern. Rough rider offers it in four handle patterns. All blades operate on their own springs with the spear master using the center lock back spring. This spring protrudes ever so slightly when the knife is closed. I don't consider this a reason not to but the knife but more an inherent design flaw caused by the location of the center lock. 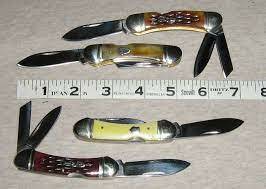 The lock is positive and all knives in the series are excellent. The Red Jigged bone is some of the darkest and best in the Rough Rider line. Blades open smoothly and work on their own spring. If you like red jigged bone, this is the canittler for you.